Turkey Tetrazzini with Almond Parmesan Topping - an intensely flavourful, very satisfying comfort food idea for leftover turkey or chicken. Heck, I'd even roast an extra chicken on a Sunday, just to have this on Monday! Start by cooking the pasta to al dente (or slightly under). Drain and set aside. Finely dice the sweet pepper and set aside. In a large saucepan or small dutch oven, brown the pancetta until a little crispy. Remove from pan and set aside. Add the mushrooms and sauté them until they get some good brown colour. Set them aside with the pancetta and peppers. In the saucepan or dutch oven that you cooked the pancetta and mushrooms, melt the butter and add the flour, black pepper, salt, nutmeg & garlic. Cook together over medium heat for 2 minutes until foamy. Whisking constantly, slowly pour in scalded milk and stock mixture in about three additions, allowing the sauce to thicken and come back to a simmer after each addition. Continue to cook for 2 more minutes stirring constantly. Butter an 8-10 cup casserole dish. In a large bowl, stir together the pasta, turkey, pancetta, mushrooms, bell pepper and sauce. When well combined stir in the 1/2 cup finely grated Parmesan cheese. Mix together the ground almonds and the other half cup of finely grated Parmesan. Sprinkle on the topping over the pasta mixture. Bake at 350 degrees for about 45 minutes or until bubbling well. 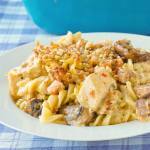 Allow the tetrazzini to sit for 15-20 minutes before serving. This allows the pasta to absorb any excess moisture and thicken the sauce.